There’s no denying that matcha is having a moment. There’s no denying that matcha is having a moment. The bitter, energizing green tea powder is so popular right now that there’s an entire Brooklyn café dedicated to it. But matcha isn’t just for drinking. It’s also an incredible tool for boosting flavor, complexity and color in desserts. Here, four deliciously bittersweet desserts to make with matcha. These super-crunchy, salty-sweet almonds are tossed in a homemade caramel, then dusted with fragrant matcha and sea salt. Crispy, chewy, matcha-spiked macarons are delicious “buns” for ice cream sandwiches. 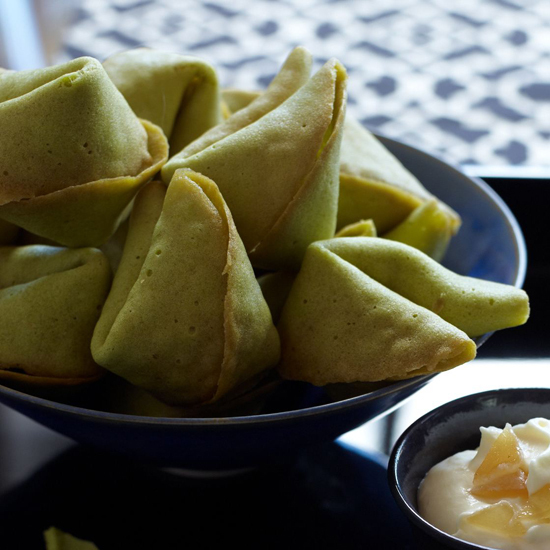 Adding matcha to DIY fortune cookies transforms the Chinese takeout staples into grown-up desserts. This cool, creamy custard is beautiful and elegant.